SOHCAHTOA is the shortcut to remember the trigonometric ratios sin, cos and tan. Let us see, how this shortcut works to remember the above mentioned trigonometric ratios. Before we discuss this shortcut, let us know the name of each side of a right triangle from the figure given below. To understand the shortcut, first we have to divide SOHCAHTOA in to three parts as given below. What do SOH, CAH and TOA stand for ? 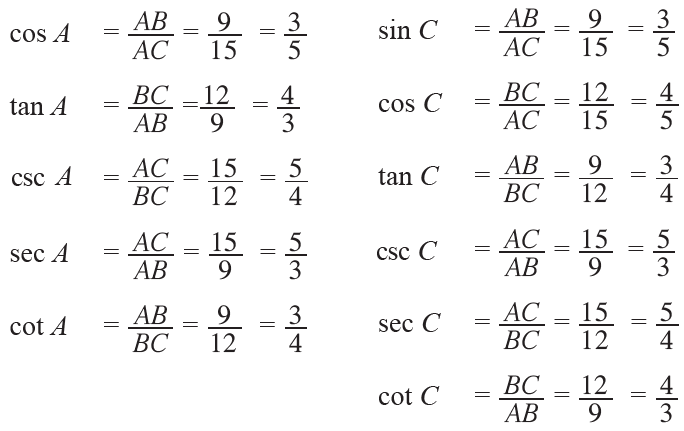 From the above figures, we can derive formulas for the three trigonometric ratios sin, cos and tan as given below. The trigonometric ratios csc θ, sec θ and cot θ are the reciprocals of sin θ, cos θ and tan θ respectively. From the figure given below, find the six trigonometric ratios of the angle θ. From the figure given above, AC = 24 and BC = 7. Now, we can use the three sides to find the six trigonometric ratios of angle θ. 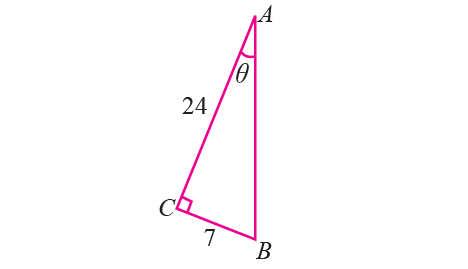 Let us consider the triangle ABC where right angled at B, with BC = 12 and AC = 15. Now, we can use the three sides to find the five trigonometric ratios of angle A and six trigonometric ratios of angle C.
After having gone through the stuff given above, we hope that the students would have understood the shortcut on trigonometric ratios.